How unusual is Trump’s Cabinet of generals? 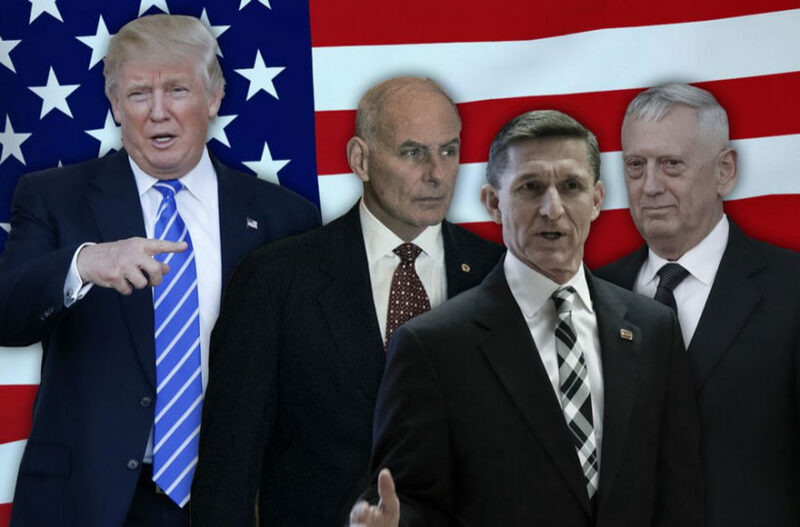 (by Rebecca Shabad, CBS News) – President-elect Donald Trump has been…staffing his Cabinet and White House, and it’s been…noted [by critics] that many of the top positions have been filled by generals. 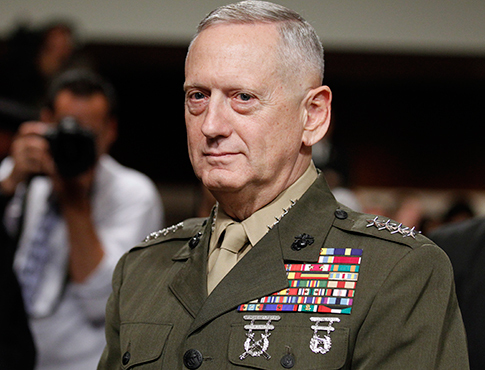 Mr. Trump has nominated Gen. James Mattis (ret.) as defense secretary and retired Marine Gen. John Kelly (ret.) as homeland security secretary**. 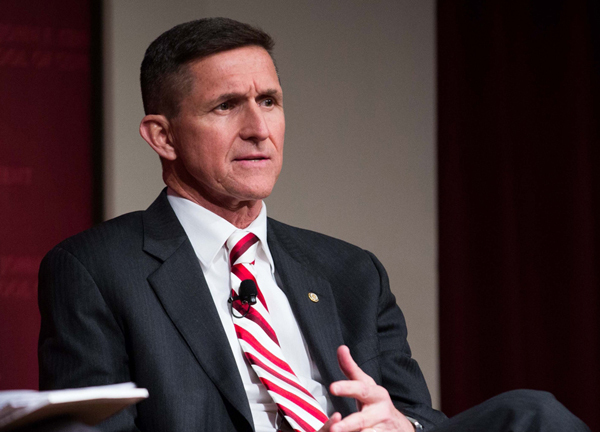 He’s also picked Army Lt. Gen. Michael Flynn (ret.) to serve as national security adviser*. CBS News’ Major Garrett has reported that Mr. Trump is reluctant to have any more than three generals occupying high cabinet and staff positions in his administration, so Gen. David Petraeus (ret. ), who had been a top contender for secretary of state, may be the odd man out. “[I]n an era when trust for government and other civic institutions is plunging, the military has retained strong public support,” he wrote Thursday. 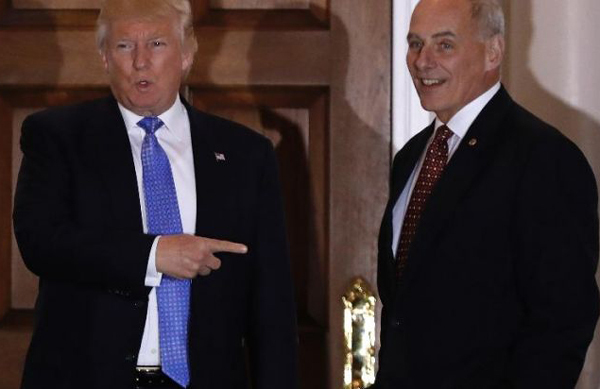 Retired Marine Gen. John Kelly was selected for Secretary of Homeland Security. During President Obama’s two terms, several retired generals held key roles in his administration. Retired four-star Marine Gen. Jim Jones, who served as Supreme Allied Commander of Europe under President George W. Bush, served as Mr. Obama’s first national security adviser. Mr. Obama tapped Petraeus to lead the [CIA]. And he nominated retired four-star Army Gen. Eric Shinseki for secretary of veterans affairs. Retired four-star Marine Gen. John Allen became Mr. Obama’s U.S. envoy to the Global Coalition to Counter the Islamic State in Iraq and Syria (ISIS). George W. Bush, too, had a general on his cabinet — in the top position. Retired four-star Gen. Colin Powell served his secretary of state. Under President George H.W. Bush, retired Air Force Lt. Gen. Brent Scowcroft served as national security adviser and later as George W. Bush’s chairman of the president’s Intelligence Advisory Board. President Ronald Reagan chose retired four-star Army Gen. Alexander Haig to serve as his secretary of state. President-elect Trump picked retired Army Lt. Gen. Michael Flynn to serve as his national security adviser. There is one cabinet post in which being a general can be a real obstacle. In order to ensure civilian control of the military, the Defense Department has banned military officers from serving as secretary of defense for seven years after serving in active duty. The Trump administration is planning to seek a waiver to make an exception for Mattis, who served as commander of U.S. Central Command under Mr. Obama. The only other defense secretary who has needed such a waiver was Gen. George Marshall — he took over the Pentagon [as Secretary of Defense] in 1950, three years after the military officer ban was put in place. Some Democrats on Capitol Hill are already voicing opposition to giving Mattis that waiver. “While I deeply respect General Mattis’s service, I will oppose a waiver. Civilian control of our military is a fundamental principle of American democracy, and I will not vote for an exception to this rule,” said Sen. Kirsten Gillibrand, D-New York, in a statement last week. Mr. Trump has not yet announced his nominations for a few remaining cabinet roles, including secretary of state. And while he may [have] maximized the number generals he can retain, there are still some available admirals. In fact, Mr. Trump met with four-star Adm. James Stavridis Thursday. The president-elect isn’t the only one who eyed him for a potential spot on his team. Hillary Clinton also reportedly vetted him to be her running mate during her presidential campaign. *The National Security Advisor serves as a chief advisor to the President on national security issues. The National Security Advisor serves on the National Security Council and is assisted by staff that produces research, briefings, and intelligence reports. **Whereas the Department of Defense is charged with military actions abroad, the Department of Homeland Security works in the civilian sphere to protect the United States within, at, and outside its borders. Its stated goal is to prepare for, prevent, and respond to domestic emergencies, particularly terrorism. 1. List the the military leaders President-elect Trump has named for cabinet posts and for National Security Advisor. 2. Critics of Donald Trump have questioned his choice of military leaders for these cabinet posts. How does David French of the National Review explain why these are good choices? 3. List the military leaders Presidents George W. Bush and Barack Obama had/have as advisors and heads of agencies. 4. a) What restriction has the Department of Defense imposed on the office of Secretary of State? b) Why have they done so? c) Ask a parent: do you think Gen. Mattis should be given a waiver? Why or why not? a) Do you think this is deliberate – to lead people to feel concern about “so many generals”? or the best way to alert the public to a concerning trend? Explain your answer. b) One reader wrote: “The media is portraying these picks as a negative. Trump picked them because he trusts them to be competent and get the job done – he believes for the position they are the best choice for each position.” Do you agree with this assertion? Explain your answer. 6. Ask a parent or grandparent: what do you think of Mr. Trump’s cabinet picks so far? Before any nominations are made, the White House Office of Presidential Personnel vets a list of candidates, including suggestions provided by members of Congress and special interest groups. A chosen nominee then must pass through a series of investigations by the FBI, IRS, the Office of Government Ethics and an ethics official from the agency to which the position is assigned. The nominee must also fill out the Public Financial Disclosure Report and questionnaires related to his or her background check. The process begins when the president provides a written nomination to the Senate, where it is read on the floor and assigned a number. This starts the Senate’s procedure of “Advice and Consent” laid out in Article II of the U.S. Constitution for the appointment of high ranking officials by the president. The president’s nomination is passed to the Senate committee with jurisdiction over the appointed position. Committee hearings allow a close examination of the nominee, looking for partisanship and views on public policy. They can also summon supporters and opponents to testify. Committees are permitted to conduct their own investigations into the nominees, as they are not always provided with the information gathered by the White House’s investigation. Once committee hearings are closed, most committees have a set amount of time before a vote is taken on whether the nominee is reported to the Senate favorably, unfavorably or without recommendation. They also have the option not to take action on the nominee. If action is taken, the committee notifies the executive clerk. The nomination is then given a number and added to the Executive Calendar of the Senate.